Hello and welcome back! I'm sharing three cards that I made with the Cake Soiree Stamp Set and coordinating Sweet Cake Framelits Dies. These are in the main catalog this year, and I wanted to give them some love. I picked a nice, bright color combo to work with. If you've been to my blog before, you won't be surprised by that! The colors I used were Lovely Lipstick, Poppy Parade, Mango Melody, Soft Sea Foam, Daffodil Delight, Balmy Blue and Call Me Clover. Hello and welcome back! Since I've been sharing a lot of Christmas preparations for 2019, I thought I would also go back and share my cards that I sent for 2018, thus the ghosts of Christmas past title. Man of the products I used are in the 2018-2019 Main Catalog, so you can copy the ideas if you choose. I used the pink constellation patterned paper from the Twinkle, Twinkle Designer Series Paper. My favorite thing about this card is that I die cut the star from a scrap piece of paper, and then sponged some of the shimmer paint through it. Plus twine and sequins finish any card right? Hello and welcome back! I've been doing some more Christmas prep. I made a fun set of tags last year with the Stitched Felt Embellishments, and you can find the details here. I still had more pieces of the felt left, so I just made more of each of the tag designs. This time I used the Real Red 1/8" Solid Ribbon for all of the tags, and added a circular element for the ribbon to tie through. I love how these turned out! Hello and welcome back! Every year I have more Christmas project ideas than I have time to complete, and I have to hurry to get my Christmas cards completed. Actually, I usually send them and my annual letter out late! Just ask my friends and family. So, for those reasons and because winter has been lingering in my area, I decided this was the perfect year to start my Christmas prep for 2019 early in the year. I'll be sharing both cards and tags, and maybe other items throughout the year this year. For the first half of the year, I'll use stamp sets and supplies that are in the annual catalog or carried over from the 2018 Holiday Catalog. 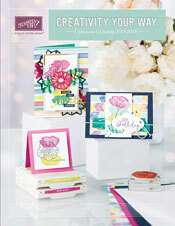 For the second half of the year, I'm sure I'll be featuring new products from the next Holiday Catalog! Hello there! I'm back today with a few simple gifts using the Labels to Love Stamp Set and coordinating Everyday Label Punch. For the fall and spring holidays (Halloween, Thanksgiving and Valentine's), I chose to use the Nature's Poem Designer Series Paper along with the colors Blackberry Bliss, Petal Pink, Cajun Craze, Mint Macaron and Tranquil Tide in inks and cardstocks. For each greeting, I stamped and punched the label image, either the plain label or a more elaborate label image. Some of the smaller greetings I punched with a small circle, and layered on the label. Others I stamped a second time in another color, and cut out part of the image to layer. Hello and welcome back! It's time for this month's Fancy Friday Blog Hop. I'm here with my fancy friends (all current or former members of the Stampin' Up! Artisan Design Team). This month we are featuring anything Christmas-y! Can you believe that Thanksgiving is only 3 weeks away in the US, and Christmas is right around the corner? You'll love what you see tonight on our fancy blog hop. We also have a Pinterest board that you can follow. You might have just arrived from Jenn's Blog. Did you see her great project?! I love her style. So, today I have a set of Christmas tags. I used the Farmhouse Christmas Photopolymer Bundle of stamps and dies to create these. I stamped the main images in Black Memento Ink, and colored them with our Stampin' Blends markers. We have so many wonderful colors now, including the ones in the holiday catalog. Hello and welcome back! I made some cute Halloween containers that I wanted to share today. I loved this Trick or Tweet Stamp Set as soon as I saw it in the Holiday Catalog. Plus the images were a lot of fun to color with our Stampin' Blends markers. Hello and welcome! I'm back today to share some holiday projects with you. I decided this year to start my prep early. My plan is to use a mix of holiday sets from the main catalog and newer sets from the holiday catalog to create cards, tags and other holiday items for this season. I usually make about 80 of one style of card, but after the designing is done it's less fun to finish them up assembly line style. So, this year, I'm going to make 9-10 different designs and make about 10 cards of each one! I always include a letter in them as well, so they will all be the standard 4 1/4" x 5 1/2" size to hold the letter. Hello and welcome back! It's time for a color challenge this week at the TGIF Challenges blog. It's a color combo that lends itself to holiday projects, so I created a set of Christmas tags. Last week's challenge was about the ombre technique, so I decided to use that too. Did you see the projects last week? They were amazing, weren't they?